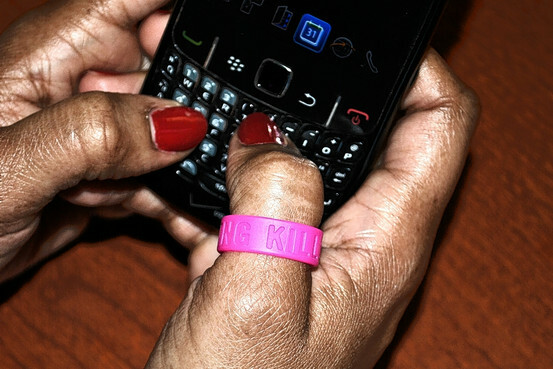 Can Handing Out 'Txting Kills' Thumb Bands Stop People From Texting While Driving? We've pointed out that some recent studies have suggested that laws that ban texting-while-driving may have actually made the roads more dangerous, because it hasn't stopped people from texting, but just caused them to further hide the activity by holding the phone down low -- forcing them to take their eyes off the road more. This isn't to say that we think texting while driving is a good idea -- it's not. But just because you pass a law trying to ban a really dumb idea, it doesn't mean it will have the desired effect, and the early evidence suggests that there are serious unintended consequences with these laws. There are a lot of celebrities out there endorsing thumb bands as a good reminder for teens NOT to text and drive. Since 3/4's of them do it and distracted driving is the number one cause of accidents and accidents kill 11 teens every day, I say the more reminders they get to be safe the better!